I live in a very small house and have a very small refrigerator. Thus, Costco, home of oversized items, is not my kind of place. However, I went there the other day to buy a few things for Molly’s graduation party. I arrived first thing Friday morning so I’d beat the just-got-the-paycheck crowds. 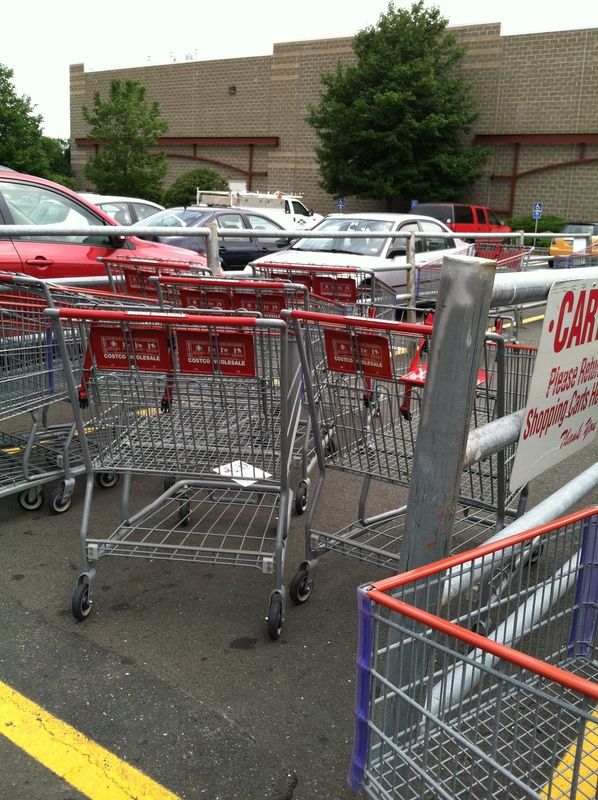 Using all my body weight, I yanked a gigantic carriage out of the cart-corral. The first clue to the fun-house world I was about to enter, was a tiny older (than me) woman completely dwarfed by her carriage, next to a man as wide as his. Costco is a shopping ‘club’ – you must belong and a card with your photo on it is necessary even to enter. Seriously? You want to spend money – be my guest – right? Flashing R’s card at the gatekeeper at the door, she waved me through with not even a glance at R’s photo. Once inside, I confess to a bit of excitement at being inside the airplane hangar shopping warehouse. I began my adventure by wheeling past the movie-theater-sized televisions, down the aisles with fans, air conditioners, flooring, towels, even mattresses were stacked against the cinder block walls. I vaguely recall thinking there was something we could use in one of those street-wide aisles – a good deal – but I was easily distracted and definitely forgot everything once I got to the food. 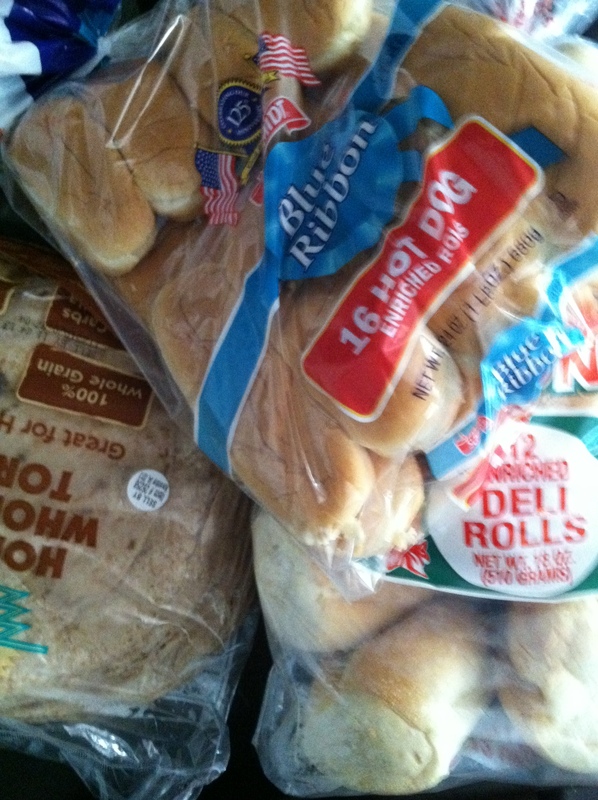 Twenty whole wheat tortillas landed in my cart, hot dog and sandwich buns – all ridiculously cheap. The mausoleum-style meat freezers were packed with every cut of animal imaginable, fish, chicken. Fruit and vegetables were impressive too, but I was getting overwhelmed. Where would I put everything? I picked up items that didn’t need refrigeration – tomatoes and 3 cucumbers, a bag of gorgeous rainbow color potatoes. 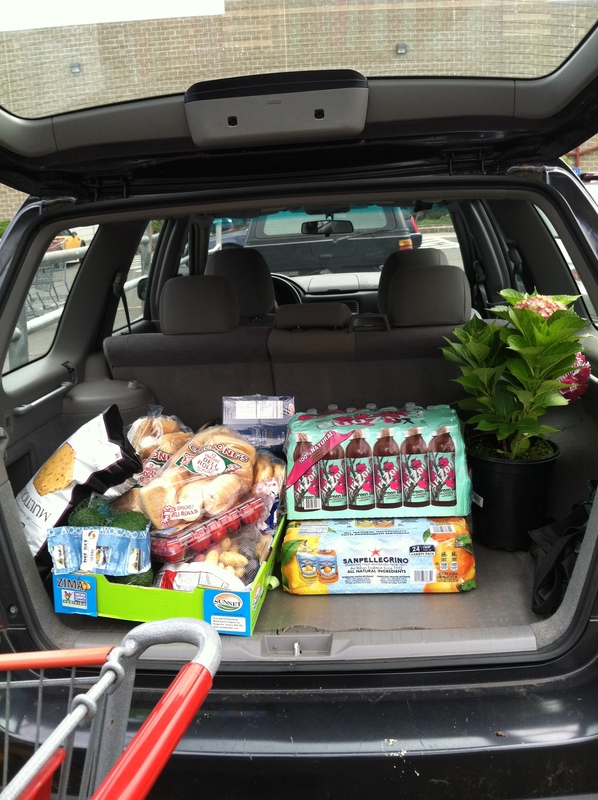 The cases of water, iced tea and Italian sodas made my monster-cart even less manageable. And soon the thrill was gone. It felt wrong, all these terrible processed foods: gigantic jars of neon orange cheese balls, mega-sized boxes of cookies and candy, restaurant supply bags of sugar. My years overseas in smaller countries with smaller spaces and certainly smaller refrigerators, still informs my food shopping habits. My fridge in Kyoto was the kind kids use in their college-dorm rooms. Same as in Croatia, Bosnia and Italy. In those places, like in much of the world, one picks up things at the market almost daily. And we knew the butcher, the fish guy, the green grocer in Zagreb and Metkovic and of course, in Italy where we regularly visited the open-air markets. Shopping for the night’s dinner, wicker basket on my arm, I regularly ran into neighbors and chatted – mostly about the weather because of my limited vocabulary. No, this big stuff, BIG way of doing things in America is not for me. After all, there’s just the three of us here — soon to be two — and we don’t need so much. 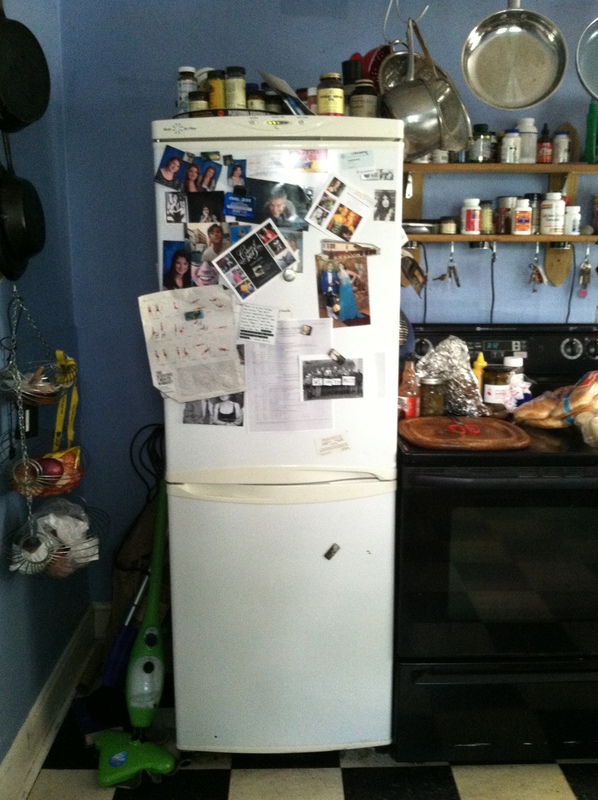 We once had an American size fridge but things got lost in it, and inevitably, we ended up throwing stuff out. This still happens even with our smaller fridge. While I confess I was briefly seduced by Costco’s carnival atmosphere and crazy offering of goods, I’d rather make my daily stops. It’s easier to grab a basket and high-tail it in and out of one of the more manageable (although plenty big) grocery stores on my daily flight path. And now that the party’s over, what the hell am I going to do with all this leftover bread? This entry was posted in Seasonal Musings and tagged Bosnia, Costco, Croatia, food, Kyoto, motherhood, Norwalk, overseas living, retail, time, travel, Zagreb. Bookmark the permalink. First of all this made me laugh because your fridge is HUGE!!! I know that feeling of being in a shop like that and suddenly feeling ill with it all. I think deep down you know SOMEONE is paying for this cheap stuff…whether it’s people on lower than low wages, possibly in a far away land, or the land itself which always pays, due to the current insistence on the cheapest food…not good for the planet, not good for us. Seduction is the business of a capitalist economy…it’s hard to resist…but maybe we should start being seduced by something different…! Yes – by European standards – but you should see the size of my neighbors! I love getting seduced most by my warm fella!